August is here, and although the summer isn't over, I'm approaching the end of my Edinburgh summer - which, in a way, is a good thing, as August is the month when the centre of Edinburgh becomes unbearable for someone who can't stand masses of tourists. 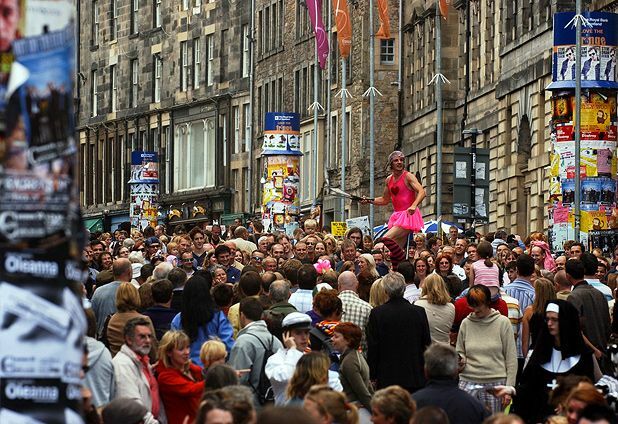 With the Fringe, the population of Edinburgh doubles, and while I'd like to go and see lots of comedy and other interesting shows, living your life in a city taken over by tourists and other visitors is far from enjoyable. I'm trying not to vent my tourist rage too much now, but what is it with people going on holiday, and immediately forgetting that there may be some people around who aren't on holiday, and who actually need to get to places at set times? No, let's just walk around really slowly, suddenly stopping in the middle of the street to take pictures and read maps, take forever to buy train or bus tickets or get cash out. Because it's not like we, or anyone else in the queue, actually need to be anywhere... Ok, sorry, rant over. Because the point of this post was not, in fact, to rant about tourists (although I'm sure you'll get to read a post like that at some point), but to talk about it being August. The Royal Mile during the Fringe, a.k.a. My Worst Nightmare. For the past *quick calculation* 18 years, August has been quite exciting. There was always something about the last days of the holidays, the approaching autumn, going to buy new school bags and pencil cases and notebooks. Later on, in upper secondary school and university, I still enjoyed preparing for the upcoming year, making timetables and planning my studies and the year ahead. I love planning and making lists, and the beginning of a new school year was always a great time for that. The excitement never lasted for more than the first few weeks, of course, but I still enjoyed getting back into a normal routine after the holidays and seeing all my friends again. After graduating, I thought August and the beginning of September would be a bit sad, as I still missed university and being a student. This summer has helped me get over my graduation angst and accept my new, non-student identity, but I still feel a little nostalgic when I think of all those years of excitedly preparing for a new year at school or uni, and I'm sure this feeling will get stronger the closer we get to September. I won't be having the uneventful transition from summer to autumn that I'd been expecting, though. I won't be staring a new year at uni or moving over from one school to the next, as in previous years, but instead I'll be spending August preparing for my big move to Scotland - selling all my things, finding out about taxes and national insurance, and meeting up with friends and family. I'm sure there'll be enough planning and list-making needed to keep me happy for quite some time.